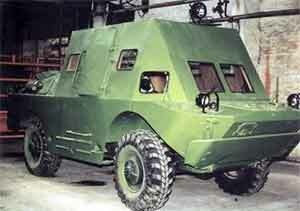 The BRDM-2 amphibious scout car was designed by V K Rubtsov of the Dedkov OKB in the early 1960s as the successor to the earlier BRDM-1 and was first seen in public during 1966. 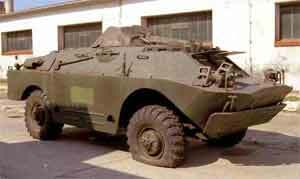 Main improvements overthe earlier vehicle are its fully enclosed armament installation, more powerful rear-mounted engine which gives it a higher road and cross-country performance, and improved amphibious characteristics. 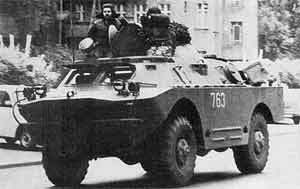 Each former Soviet motorised rifle division had a total of 28 BRDM-2s, 12 in the reconnaissance battalion and four each in the tank regiment, BMP-1/BMP-2-equipped motorised rifle regiment and in each of the two BTR-60/BTR-70-equipped motorised rifle regiments. 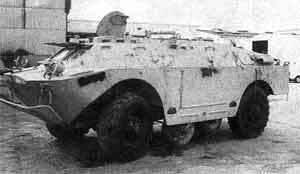 Each tank division had a total of 28 BRDM-2s, 12 in the reconnaissance battalion, four in the motorised rifle regiment and four in each of the three tank regiments. 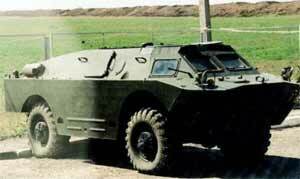 The BRDM-2 is a fully armored, four-wheel-drive, amphibious reconnaissance vehicle. 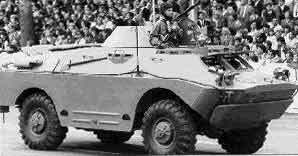 It has two-pairs of belly wheels and a centralized tire pressure regulation system for increased cross-country capability. 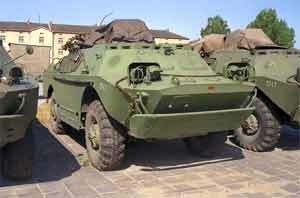 The BRDM-2 has a box-like hull with a boat-shaped bow. 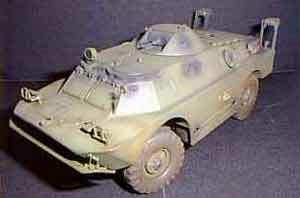 The engine is mounted in the vehicle rear and there is a small conical turret mounted on the hull above the belly wheels. 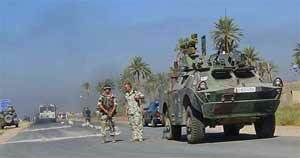 The driver sits at the front of the hull on the left with the vehicle commander to his right. 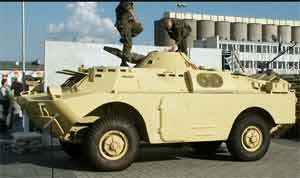 To enter the vehicle, the crew must climb through two roof hatches. 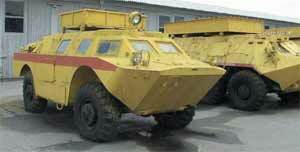 The hull, which is constructed of welded steel, provides the crew with protection from small arms and shell splinters. 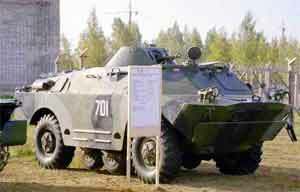 The turret, which is very similar to that of the BTR-60PB and Czechoslovak OT-64, is located in the center of the vehicle and is armed with a 14.5-mm KPVT machine gun with a 7.62-mm PKT machine gun. 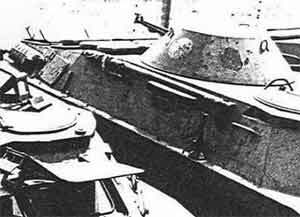 On either side of the hull adjacent to the crew position, there is a firing port. 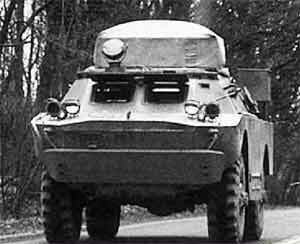 Immediately behind the firing port are three vision blocks which protrude from the outside of the hull, giving some vision to the front and rear of the vehicle. 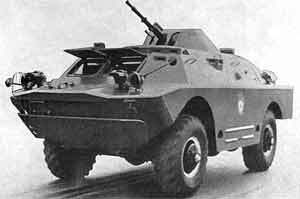 The belly-wheels are chain driven and are lowered by the driver and give the BRDM-2 improved cross-country performance and the ability to cross ditches. 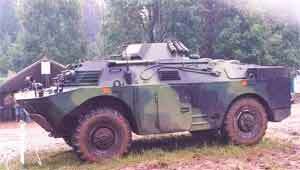 The driver can adjust the tire pressure on all four tires or individual tires while the vehicle is in motion to adjust to the ground conditions. 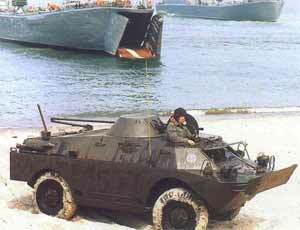 The BRDM-2 is fully amphibious. 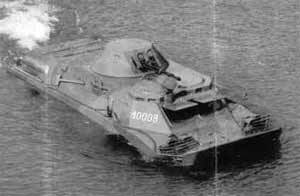 It is propelled in the water by a single water jet at the rear of the hull. 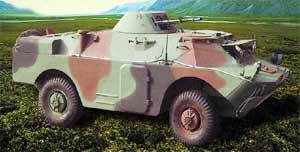 The vehicle has an over pressure NBC system. 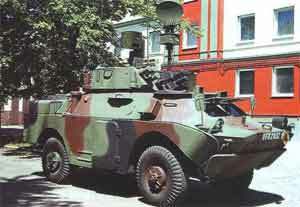 The BRDM-2 is equiped with infrared driving and search lights, a radio and aninertial land navigation system. 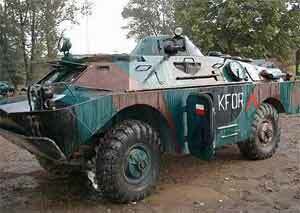 At the fron tof the vehicle is a winch which has 30-m of cable and has a maximum load of 4000-kg. 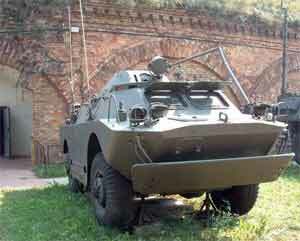 BRDM-2-RKha (Radiological-Chemical-Biological Reconnaissance Vehicle) This is the chemical reconnaissance verion of the BRDM. 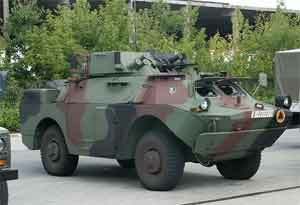 It is equipped with lane-marking poles and flags. 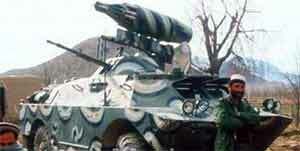 The flag/pole dispensers are located on the rear corners of the vehicle hull. 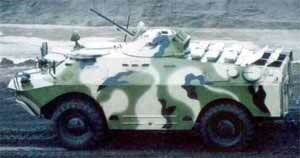 This version retains the standard 14.5-mm machine-gun. 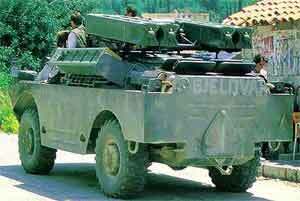 BRDM-2-RKhb This is another chemical reconnaissance version which is armed only with twin 7.62-mm PKT machineguns. 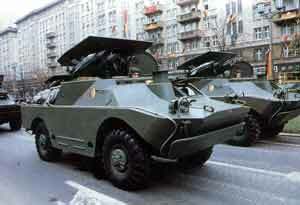 BRDM-2U Command Vehicles The BRDM command vehicle consists of a BRDM-2 with the turret removed and additional radios and antennas added. 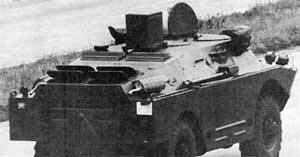 There is also a generator which is often mounted on the vehicle roof, immediately behind a central hatch which is in place of the turret. 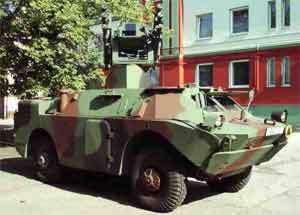 BRDM-2 with AT-2b SWATTER-C ATGMs This vehicle consists of a BRDM-2 with its turret removed and in its place, a quadruple launcher for the AT-2 ATGM which was converted from its original radio command-to-line-of-sight guidance to semi-active infra-red/command guidance. 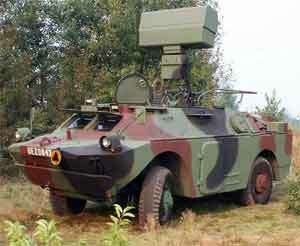 This missile weighs 29.48 kg and has a range of 3500-m compared with the 3000-m of the original Swatter. 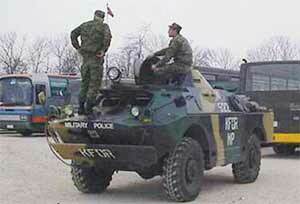 A total of eight SWATTERs is carried including the three in the ready to launch position. 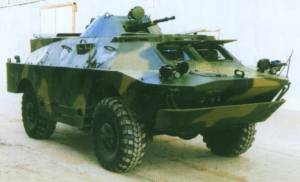 9P122 BRDM-2 with AT-3 SAGGER ATGMs This vehicle is a BRDM-2 with its turret removed and fitted with a platform, under which are mounted six SAGGER AT-3 ATGMs. 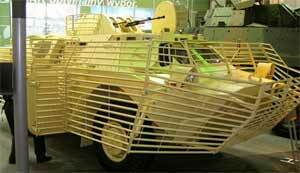 This platform is carried within the hull under armor protection whicle travelling. 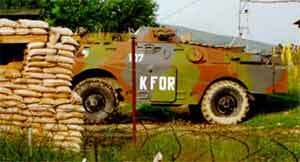 When engaging targets, the platform is raised. 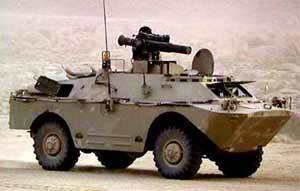 The gunner, who is seated on the right side of the vehicle, controls the missile through a sight mounted on the front right of the vehicle roof. 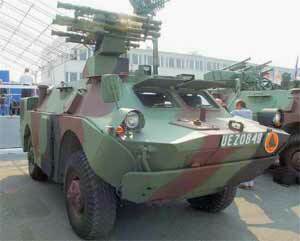 The vehicle carries eight additional missiles, and the platform can be rearmed while lowered. 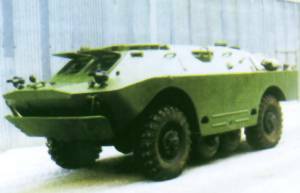 9P148 BRDM-2 with AT-5 SPANDREL ATGMs This vehicle consists of the BRDM-2 with the turret removed and replaced with a rotating ATGM launcher. 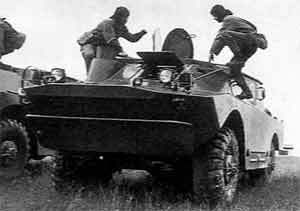 The crew reloads the launcher through a small hatch located behind it. 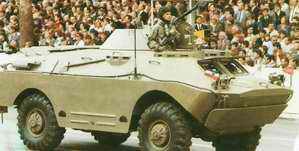 The gunner controls the missiles through a sight mounted on the front right of the vehicle. 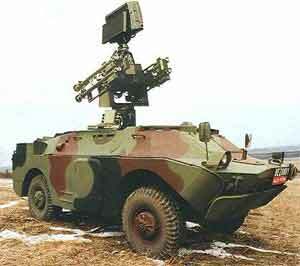 On 9P148 ATGM carriers, the launch platform can be fitted with AT-4 Spigot ATGMs. 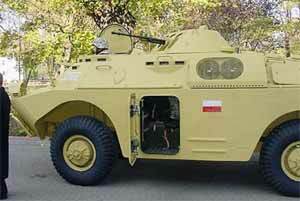 The vehicle can carry either 10 AT-5 SPANDREL reloads or a combination of AT-4 and AT-5 (i.e. 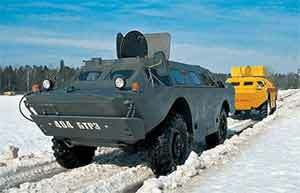 6 AT-5 and 8 AT-4). 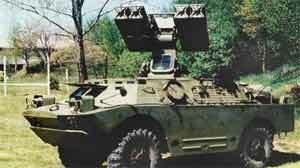 SA-9 GASKIN Surface to Air Missile System The SA-9 GASKIN consists of a rotating surface-to-air missile launcher/turret mounted on a modified BRDM-2 chassis (the belly-wheels have been removed). 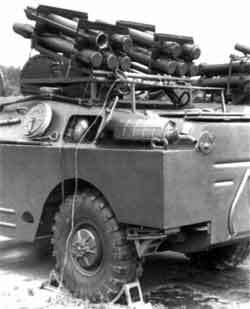 The launcher/turret is fitted with four SA-9 GASKIN infrared-seeking, fire-and-forget missiles, and is manned by one man. 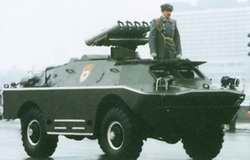 An additional missiles can be carried on either side of the hull.